“The logical extension of business is murder”. In an April day of the year 2000, 28-year-old multibillionaire finance whiz Eric Packer gets up from a sleepless night. He watches the day dawn over Manhattan, then crosses the rooms of his triplex (which he paid, as we will learn, $ 104 mln) and summons his stretch limo. On this day, against all odds, he is making a humongous bet on the yen, in an operation of such dimensions that even his entire wealth may not suffice to cover it. He is also under the impression that he needs a haircut, and embarks therefore, against all odds (and there will be many), on a trip across a particularly busy midtown Manhattan: the point being where he will get his haircut. In the course of the day and at different stages of his progress cross town he will meet several of his employees, including his experts on technology, currency, finance, and theory; besides other encounters that for now are best kept secret. But why does his behaviour grow increasingly self-destructive? And what exactly is the threat he’s facing? This is DeLillo’s first post-9/11 novel. Which is a curious definition, because he had been writing 9/11 novels since the seventies. But beyond mere chronology, Cosmopolis is his first book to deal with the event: with its meaning and most crucially with its causes. It is also curious that his first post-9/11 novel does not take place after 9/11, but some sixteen months before. Reportedly, the novel was already in the works by September 2001. Which proves that, even in the noughties, DeLillo’s understanding of society is so keen that he seems endowed with the power of foretelling. The setting, as stated in the opening page, is “IN THE YEAR 2000. A Day in April”: exactly when the dot-com bubble burst. Once again, DeLillo offers the reader an insight of where US society is and of where it is heading. As the novel proceeds, one cannot help the feeling that the States willed themselves into the bubble. And from there it’s only a small step to read the novel as prescient of the current economic crisis, another ill of capitalism that was fully predictable all along. The whole novel is about “The interaction between technology and capital. The inseparability”, in the words of one of Packer’s collaborators. There are various references to animals in the opening sequence, possibly a symbol for Eric Packer’s predatory nature: he watches a gull, “feeling the sturdy earnest beat of its scavenger’s ravenous heart”. His pets are a shark in a pool (!) and borzoi dogs. But most importantly there are the references to rats: I counted no less than a dozen. The first comes in the epigraph: “A rat became the unit of currency”. This is a quote (unreferenced) from the poem Report from the Besieged City by Polish émigré Zbigniew Herbert, written in his Parisian exile while Poland was under martial law. I read the quote as a reference to the end of Communism: the novel’s setting is clearly post-Cold War and pre-9/11; while the line mirrors the focus on turbo-capitalism. In the novel Eric, who reads poetry as a remedy for his insomnia, knows the poem and will recognize the line in a topical moment of the story. Various themes dear to the author are also present. The anarchist protest on Times Sq. is pure DeLillo. Moreover, it seems to predict the news of another September: the Occupy Wall St. anti-finance protests which began in September 2011. Meanwhile, one of the novel’s most interesting characters is Benno Levin, another of DeLillo’s “men in small rooms” (Libra 181) who secretly plot deathward. There are in fact several levels of resonance with Libra. Levin wants to write “ten thousand pages that will stop the world”, which is oddly resonant of the definition DeLillo gave of the Warren Commission Report, “the megaton novel James Joyce would have written if he’d moved to Iowa City and lived to be a hundred”. Speaking of which. One day, dawn till twilight and into the night; one character on a trek across the city that also represents the world (Cosmopolis indeed). What does it remind you of? Exactly. DeLillo is a self-admitted lifelong admirer of Father Joyce, as he calls him. Interesting parallels can be drawn between the two writers; not the least of which is the fact that both were educated at Jesuit institutions. Some of DeLillo’s characters bear striking similarities with Joyce’s (Stephen Dedalus and Nick Shay, that’s an interesting subject). Anyhow, do not expect a full-fledged postmodernist version of Ulysses. Inch’allah. In fact, DeLillo is careful to eschew the trappings of such a situation, and downplays any confrontation on equal footing with irony: there will not be a Packersday, since there is no way of knowing exactly in which April day the events of the novel take place. By the way. I find it curious that inspiration from A Portrait of the Artist produced (along with, well, I guess two dozen different sources of inspiration) the mammoth Underworld, while a rendering of Ulysses was channelled in the short and compact Cosmopolis. Underworld also springs to mind because of its counter-chronological progression: just as its last part (before the present-day Epilogue) is set in the Bronx of Nick Shay’s adolescence, Eric Packer’s final destination is the Hell’s Kitchen neighbourhood where his father grew up, “in loud close company, in railroad flats, and happy as anywhere”. Both characters are in search of a missing father. As a child Packer used to go to the movies with his widowed mother: doesn’t this remind you of the touching scene in Underworld in which a very small Matt Shay goes to Loew’s Theatre, looking for his father’s ghost? Also this. Vija Kinski, Packer’s chief of theory, comes out with a commentary reminiscent of Underworld’s closing and of Sister Edgar’s death: “People will not die. Isn’t this the creed of the new culture? People will be absorbed in streams of information”. DeLillo’s treatment of the subject is, as always (one of the reasons why I love his work), above all stylistic. For the occasion he sheds the jazz phrasings of Underworld and adopts a hard, economical style. Over the years, his prose has been criticised as ice-cold. Readers who agree will have to acknowledge that in this particular case such prose is the best of tools. Although I’ve never read their work, my bet is that old man Don has outplayed McInerney and Easton Ellis at their own game. In a novel full of dialogues, there’s constant attention to the lexicon of various fields. Finance and technology are obviously related and prominent, but there’s more: Torval’s (Eric’s head of security) coded language is exhilarating. And technical vocabulary overlaps with slang: “Men talked business in tattoo raps, in formally metered chant accompanied by the clang of flatware”. Which brings us to the prominence of music in the novel, particularly hip hop: which is the sound of NY and a genre most focused on the spoken word. And it’s not just the music itself, for Cosmopolis is made up of the same elements that created hip hop: the streets & car horns, the tar & concrete, the skyscrapers & brownstones, the loud, crowded, impossible contact of Jewish diamond cutters and Somali restaurants. Cosmopolis is dedicated to Paul Auster, who in turn dedicated Leviathan (1992) to DeLillo, a book which bore many similarities to DeLillo’s Mao II (1991). 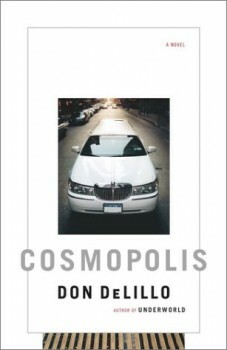 Despite the decade elapsed meanwhile, Cosmopolis was perhaps DeLillo’s first chance to reciprocate the favour. Moreover, Cosmopolis is a NY or rather a Manhattan novel, like so many by Auster. The film stars Robert “screaming girls” Pattinson as Eric Packer, and the gorgeous Sarah Gadon as Elise Shifrin. The actress has just played Emma Jung in Cronenberg’s most recent A Dangerous Method, besides sporadic appearances in the TV series Murdoch Mysteries (which I guess no one knows about, except for me). The high profile will hopefully give Don’s work a nice boost. I can’t wait to see how Cronenberg rendered some of the crowd scenes in the novel: the anarchist protest, the rave, the funeral, especially the movie shooting (how will that feel, inside the movie? ); but I’m curious about the private moments as well: André Petrescu is just one example. The trip cross midtown would in itself be worth watching. I’m more and more convinced this novel will make a great film. I can’t see the point of those who argue otherwise. Clocking in at a round 200 pages, the novel is compact and action-filled, packed with brilliant dialogues and funny characters. This was written by alessandro montagner. Posted on Tuesday, June 11, 2013, at 11:23. Filed under English, LETTERATURA, Narrativa. Tagged capitalismo, Don DeLillo, film, New York, post modernismo, U.S.A.. Bookmark the permalink. Follow comments here with the RSS feed. Post a comment or leave a trackback.